For a change, this year, we decided to explore some of our own country rather than go overseas. Although I had been to Adelaide in South Australia many times for business, in another life, there were a few places there I had had on my 'bucket list' for a long time. The fact that the state is the major producer of wine in the country hadn't escaped my attention either. We began our drive west early as we had a long way to go the first day. Up over the Great Dividing Range on a cold frosty morning and by passing the Australian capital, Canberra, the car thermometer showed 0° C. Signs of things to come, we thought, as we headed inland. 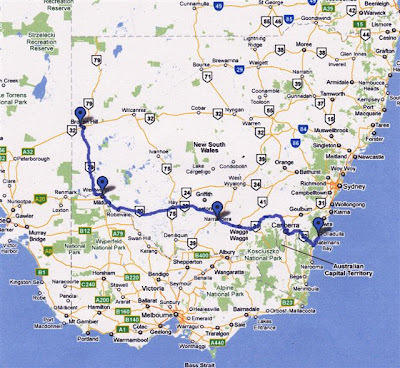 From Yass we crossed the Murrumbidgee River at Gundagai and basically followed its course into Wagga Wagga for lunch and then eventually to another old river port of Nerrandara to stay the night. We had to make sure we were carrying no fresh fruit or vegetables because the Murrumbidgee Irrigation Area and Sunraysia are big fruit growing areas and are fruit fly exclusion zones. Big fines apply for non compliance. I was surprised to see that none of the quarantine barriers were manned nor were we stopped for a random check. Next morning we left the rolling hills of the eastern Riverina and expected to enjoy the flat treeless Hay Plains but ran into thick fog which we drove through for hours. Hay was a nice town for a big country breakfast with a lot of well preserved late 19th century buildings. Suddenly an hour later we were into bright sunlight and a cloudless blue sky outside another old river port of Balranald on the edge of mallee country where the Murrumbidgee turns south to join up with the Murray. The Mallee is an area named after several species of Eucalyptus which grow in a short multi trunk form from a huge root ball in sandy marginal country. Another hour on and we were back in civilisation. Huge areas of vineyards and fruit orchards suddenly appeared at Euston and it was here we had our first glimpse of the Murray River. Sunraysia is wine and table grape country. They produce over 95% of the nation’s sultanas and raisins as well as 20% of the wine here. Citrus (21%), almonds (55%) and olives (33%) as well as huge amounts of vegetables are also produced. 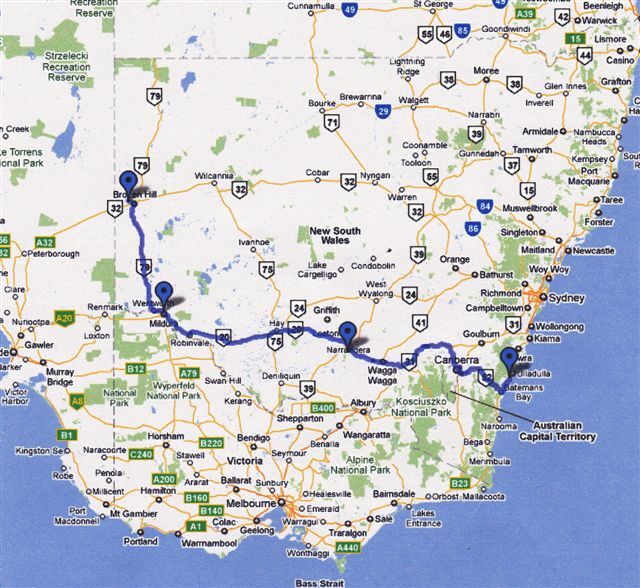 Then it was over the river border into the state of Victoria and the main town of Mildura. The area was once a pastoral lease but this failed and was taken over by the American Chaffey brothers in 1887 at the request of the Victorian parliament to establish a model irrigation settlement based on their success with a similar project in Ontario, California. The Mildura Irrigation Colony was formed and a thriving fruit and vegetable growing industry was established by pumping water up from the Murray in steps by steam driven pumps and irrigating 13000 ha (33,000 acres) of what was previously unproductive mallee land. The area now covers well over 50,000 ha. The Chaffey brothers wanted to make the town a vibrant community. Their plans included many visionary concepts. Prominent locations were made available for churches and facilities for clubs were encouraged. Parks and town transport were well considered and resulted in the beautiful central Deakin Avenue, one of the finest thoroughfares in Australia. Lanes and streets were well laid out in grid form and Mildura is one of the few places in Australia where you will find the American system of naming streets by numbers. Many fine old buildings remain including the restored original pastoral homestead as well as the Chaffey home 'Rio Vista'. The lifeblood of the city is the river and, in the past, it was also the main transport route. Wool, timber and produce was brought down the Murray, Darling and Murrumbidgee Rivers by paddle steamer via Mildura on the way to the coastal ports 880km (550 mi) downstream in South Australia. The return journey brought up the necessary supplies for the developing towns along the Murray/Darling System. We of course could not resist a paddle steamer tour down the river for a few hours through some pretty beautiful scenery with huge river gums lining the bank and a rich bird life. The rivers in the old days however were only navigable for 4 to 6 months a year due to varying water flows. A series of locks and weirs were planned for the entire system to control water levels and allow year long navigation but only a few were put in before the development of railways signalled an end to river transport. Normally our tour would have taken us through Lock 11 but it was down for maintenance. At least we got to have a look at it from downstream. The river is used mainly for recreation these days. Fishing is very popular and anglers seek out the Murray Cod which can grow up to 50kg (110lbs). The New South Wales border runs along the southern bank of the river so although you may be standing in Victoria to fish, you are casting into NSW waters so need a NSW fishing licence. Water skiing and power boat racing are also popular as is the hire of house boats for self guided cruises down the river. There are some pretty fancy ones available with five double bedrooms downstairs and a kitchen and huge entertainment area up. dishes changed daily at the whim of the chef. We had grilled scallops on the shell with bread gratin, slow roasted pork belly with braised lentils and cabbage, hand made gnocchi with gorganzola, braised magret duck with celeriac mash and snow peas and finally caramel panna cotta with blood orange. The wine list read like an oenology encyclopedia. I finally selected a Montepulciano Sangiovese which went great with the first four courses. The Murray-Darling Basin is one of Australia's largest drainage divisions and covers approximately one million square kilometres or one-seventh of the continent. It stretches from Queensland's channel country through NSW to the Australian Alps, Victoria's north-east and the Riverina, and on into South Australia's Riverland and the Coorong at the mouth of the Murray. About 85 per cent of all irrigation in Australia takes place in the Murray-Darling Basin, which supports an agricultural industry worth more than $9 billion per annum. Water use in the Basin has increased five-fold in less than a century. The problems caused by over-allocation have been exacerbated by severe drought and the early impacts of climate change. There is insufficient water to maintain the Basin's natural balance and ecosystems, resulting in a marked decline in its ecological health. In agreement with the affected states, there are Commonwealth plans being instigated that will hopefully not only stop but reverse this critical situation. About 30 minutes drive out of Mildura at Wentworth, the Darling joins the Murray. It is interesting to compare a picture today of that area with one of yesteryear. Driving out of Wentworth directly north 300km to Broken Hill, we took a short detour to the Perry Sandhills. Finally we were in what seemed like outback country. According to geologists, these sand hills originated after an ice age (40,000 years ago) and are formed by wind erosion over thousands of years. The hills are a unique land formation of 160ha (400 acres) of continuously shifting sand dunes. Skeleton remains of giant mega-fauna (kangaroos, lions, emus and wombats) have been found there. Aboriginal tribes used this area to camp and hunt. Evidence of this is still being uncovered as the sands drift. But there was no time to dilly dally here as we had to make the "Silver City" well before dusk to reduce the danger of wildlife collisions eg. kangaroos, camels, emu as well as wandering cattle and sheep. Luckily we had filled up with petrol at Mildura as the only roadhouse on the route, halfway up the highway at Coombah, had run out. But they still had cold drinks!